Welcome to my Grow Your Blog party and GIVEAWAY! I'm excited to join this event as 500-plus bloggers come together to support one another and share their blogs. Thank you to Vicki at 2 Bags Full for organizing this event. Stay tuned until the end. I have some great prizes for you to win! Here's a sneak peek . . .
Why The Beautiful Matters? I love this name, and that "matters" can be a verb or a noun. I think of it mostly as a verb, as in the beautiful things in life really do matter. A baby's chubby little fingers, the sun breaking through the clouds at twilight after a long, gray winter's day, a velvety rose slowly unfolding its petals, sun sparkling on raindrops, a homemade apple pie fresh from the oven. We could fill pages with the beauty that surrounds us every day. Our job is to stop and notice, to see with open hearts and minds, and to be grateful. Let's face it. Much of life is hard. All of us have suffered a loss of some kind. We listen to the news, and can become overwhelmed with the tragic events unfolding around us. Will fixing a beautifully laid tea tray, with a flower and a plate of homemade cookies on it, solve the world's problems? No. And yet, it can change everything. So can ironing vintage linens, growing vegetables, comforting an ailing friend, putting on a pretty dress and strappy heels. Writing a letter. Basting a turkey. Organizing a closet. Trying a new lipstick color. When we notice beauty in all its forms, when we give thanks, when we walk with an attitude of mindfulness, we can change our world and bless those around us. So in that spirit, I'll be sharing beautiful things . 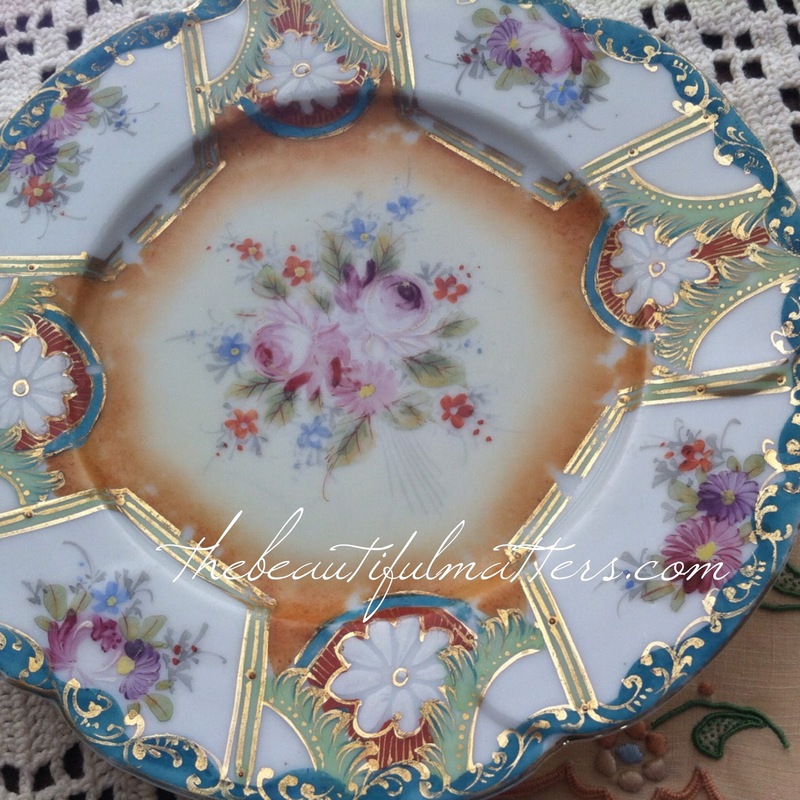 . . lovely heirlooms, pretty tea tables, encouragement from my heart, beauty and style tips and products, and more. I hope to inspire you that The Beautiful Matters. To win some beautiful prizes, pictured below, please leave a comment. The contest is open to everyone, whether or not you have a blog. And I will ship anywhere in the world. The winner will be announced on February 15. If you need to comment as Anonymous, please leave your name at the end of your comment. I would love for you to follow me on Google+ or Google Friend Connect, too (see top right sidebar of this blog). Follow me on Pinterest as well! I love creating boards of beautiful things (see the right sidebar for my latest pins). 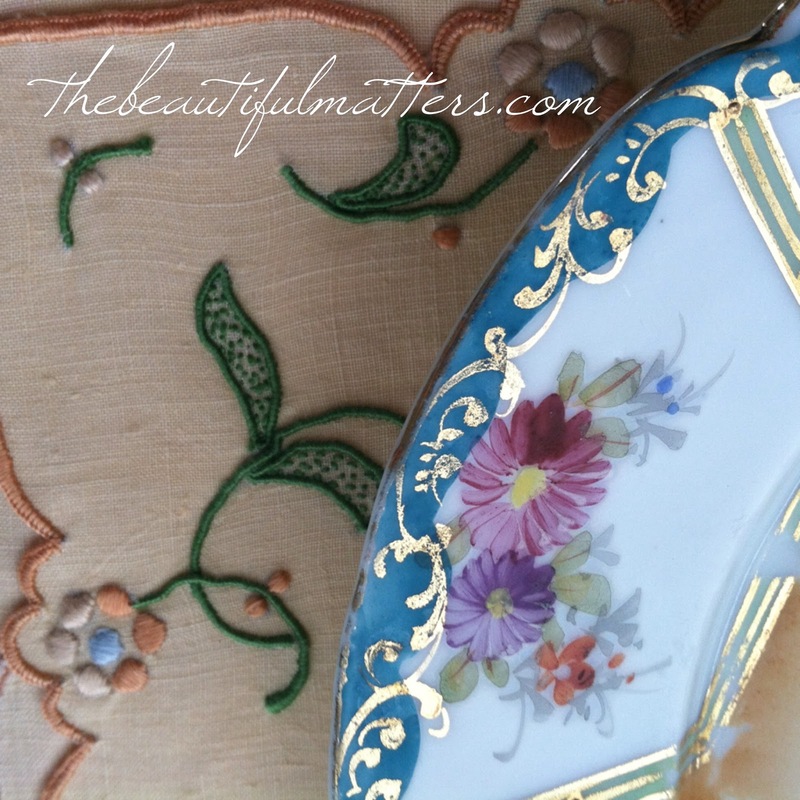 The winner will receive these beauties . . . .
A vintage dessert plate and two vintage napkins from my own collection, perfect for a tea party. 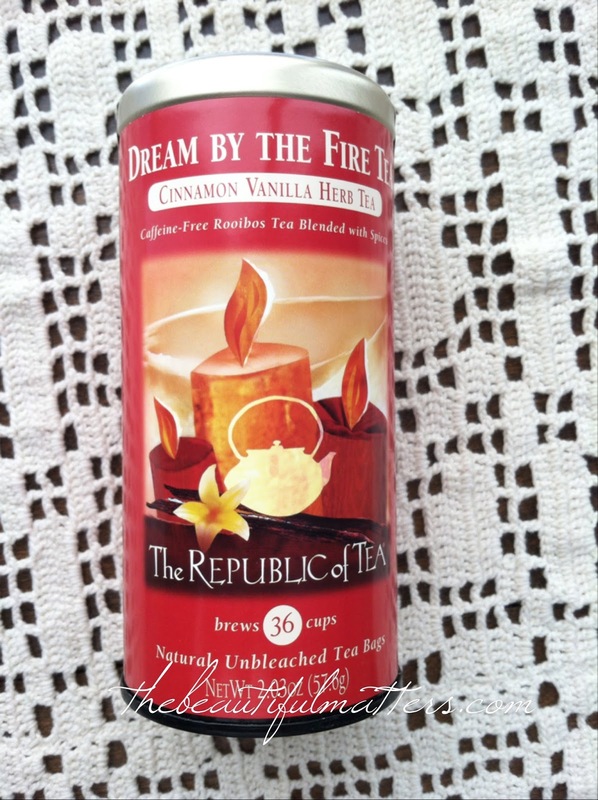 Some lovely cinnamon vanilla tea for sipping by your fireside. 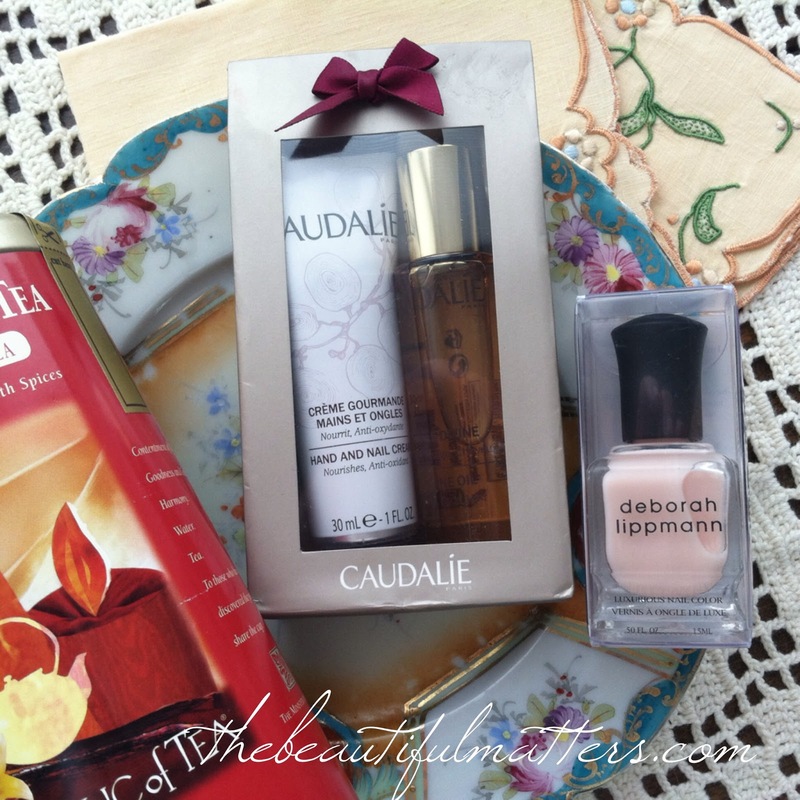 Beautiful nail polish by Deborah Lippmann in Baby Love, elegant and appropriate for every occasion, and this set of hand and nail lotion and body and face oil by Caudalie, a premier French natural skin care company. Thank you for stopping by. I hope you'll become a regular reader. Now I'm going blog-hopping myself, and meet some new friends! Maybe I'll meet you. p.s. 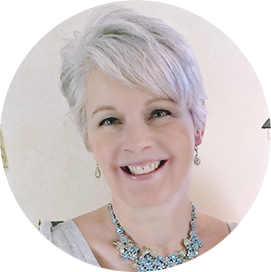 a big shout-out to Karen at KarenValentineDesign for designing my beautiful blog. 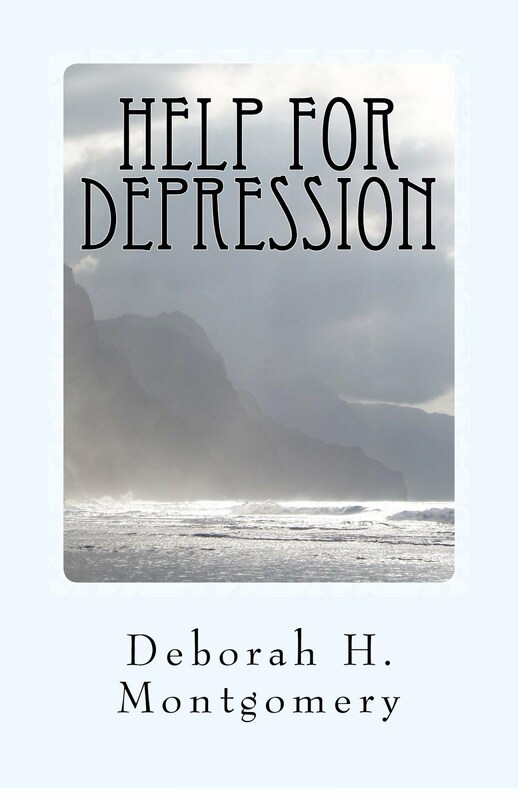 If you need help, please visit her site! Good morning Deb! Visiting you from Grow Your Blog hop today -- enjoyed your post about yourself and you are certainly giving away some lovely items. Look forward to getting to know you better and wishing you a blessed weekend. Your blog is lovely. Who doesn't love post after post of pretty! Glad I popped by, looking forward to more. Your blog really is beautiful...and you're right, beautiful does matter. It's like seeing a little bit of sunshine on a miserable day. Yes, yes, yes!!! I'm so glad to find your blog and read your thoughts. I've also been thinking lately how very important -- indeed, crucial -- it is that we create, celebrate, and enjoy beauty. There are terrible, ugly things in this world, and one way to combat the evil is to celebrate beauty in all its forms. Love that verse also. Did you know that "The Beautiful Matters" is a poem by Richard Wilbur? (I think that's the title of it -- it's been several years since I read it.) You should look it up. He, I think, chooses the title line for much the same reason you do. Blessings on you today! Sorry to comment twice ... but the oddest thing just happened, Deborah! I read your comment at my blog (Through a Glass, Darkly), and how you said you also used the quote I have in my blog title. I intended to click your name and then your blog, but instead I clicked back over to Vicki's GYB post, looking for other blogs to peruse. As I scrolled her list, I noticed the title of your blog, The Beautiful Matters, and I thought, "That's a Wilbur poem that I really like. I need to read THIS blog." So I did. And after that other comment, I noticed the quote in your sidebar, and it was you -- out of 500 blogs -- isn't that odd? Well, nice to find you. It seems we have a bit in common! Hey Deborah! I just love the Phil 4 scripture..... Your blog is just filled with beautiful things.. Love your heart and your faith.. The sidebar.. "sparkle is good for the soul"... that is just great! What a great give away too. I am definitely following along with you.....come on over and visit with me....I think we have much in common..you are so right the beautiful does matter...especially when the beauty of the heart shines through.. Blessings! Beautiful blog! Thank you for finding me and following me. You too have a new follower... and yes, I believe we are kindred spirits! Lovely blog and look forward to following you and becoming a new friend. I'm a new follower and would love a chance to win your giveaway. Hi There, I am your new follower. I would like to enter for the giveaway too. Beautiful blog heading, you and Karen did a great job. I would love to be included for a chance at your giveaway. Di@Cottage-wishes. Such a beautiful blog...I have bookmarked you so I can come again and browse more of your blog...thank you for such a lovely giveaway. Lovely blog, reminds me of spring. My weather has been below 0 a few days this week and does not show any signs of warming up. Greetings from the Inter mountain west! I would love to join you in a cup of tea! You have a lovely blog and I found you through the Grow Your Blog. I will be back to visit. I've become a follower so I can keep up with your beautiful blog, and thank you for such a fantastic giveaway!! Hi Deborah! Looks like the party is off to great start!!! It was so nice to "meet" you this week! Thank you so much for the wonderful shout out!!! I suspect your blog will continue to grow and thrive. Your spirit is beautiful and so are your pics!!! Good luck my friend!!! Thanks for visiting my blog and taking time to comment. 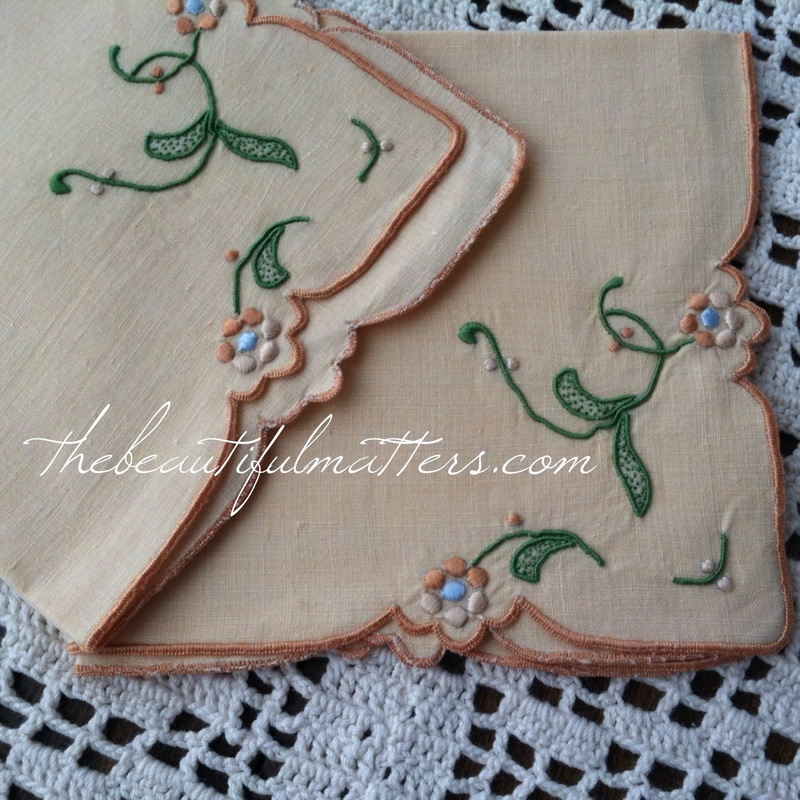 Your blog is lovely and I'm always happy to promote any blog that thinks "the beautiful matters". We seem to have a lot in common and I so enjoy my visits here. We all need to take time for tea, flowers and well, anything beautiful that makes our day to day life special. What a nice idea! or rather many ideas! Thank you for putting my name in the hat for the drawing. The photos on your blog are lovely. After reading your post about a dinner and movie at home, I feel like curling up by a warm fire. I will be following you on Pinterest as well as following your lovely blog. Hi Deborah and your blog is just stunning! I look forward to seeing your new and old posts. Hi again Deborah, I'm so glad I came to visit; LOVE your blog. Beauty does indeed matter; it adds pleasure and hope and makes us smile. Your giveaway is generous and beautiful. The linens are stunning and the body and nail products fabulous. Have a wonderful week. I'm a new follower. Hi from da UP. This is turning out to be the winter that just won't quit, isn't it? I'll be back to peruse your blog when I finish hopping. Stay warm! Agreed, your blog is super lovely! So fun to see the beauty you display well, beautifully! What a charming place to visit, your blog! I'm glad I popped in. Enjoy the party! Hope you are enjoying the blog party. You have a lovely blog. Thank you for joining my blog - it's so lovely to meet you at Vicki's party! You have the most beautiful blog. Not only that but I read your latest "tea" post and I love how you turn the season of winter into a positive - life's too short to waste time focusing on the negatives. Your giveaway is divine - I'm already in love with your pretty plate and those gorgeous vintage napkins - I'm keeping my fingers crossed! I'll be back once the party winds down and get to know you better! Hey Deborah, You do share some gorgeous things. I really like your tea cup and pot, and your super bowl party looks like so much fun! It was so nice to meet you. You're so right...the beautiful DOES matter. Your blog is full of beautiful photographs and the work of your hands and heart. Visiting via Vicki's GYBP and enjoying your blog. What a beautiful blog you have! Thank you for your sweet comments on my plaid tablescape! Lovely giveaway here! I'm following you! Oh, such a delightful blog. It is a pleasure to read. Glad I found you. Happy hopping! Thanks for sharing your blog. I'm slowly working through the list. Mine is about embroidery. Best of luck! I would love to be entered in your giveaway. Caudalie products are so luxurious and they smell so good. I'm off to read some of your previous posts now, have my cup of tea and am looking forward to getting to know you better. What a lovely blog. I am an Ohio neighbor and would love to enter your give away. I love DL nail polishes. Your posts are so spot on, in this time if my life. Many thanks. I don’t have a lot of blog time in for I just started blogging when I joined the blog party it was my New Year resolution. 600 entries and I am Reading my 425 blog and more to go. Whew a lot of good read and great giveaways too. My site http://overboardcreations.blogspot.com/ and contact info is ovr_brd@yahoo.com I believe inspiration comes from all facets of life even knowing the great people out there with wisdom and knowledge the do's and don'ts and even the wonders of life from a personal point of view. And loving the crafting networks. Oh thanks for letting me part of your giveaway. Thank you, Deborah - your blog and posts are so refreshing. I'm glad I stopped by. Love your blog and yes, Karen does beautiful work. Lovely giveaway. So nice to meet you! Your blog is quite lovely. I enjoyed visiting your blog. What a great giveaway! Hi Karen, beautiful does matter and I look forward to following your blog especially as you have a beautiful tortie blog cat too.